New Exhibit - "Air Raid Pearl Harbor - This is No Drill"
Our regular seasonal USS Hoga / Pearl Harbor-themed exhibit has returned, with new material. 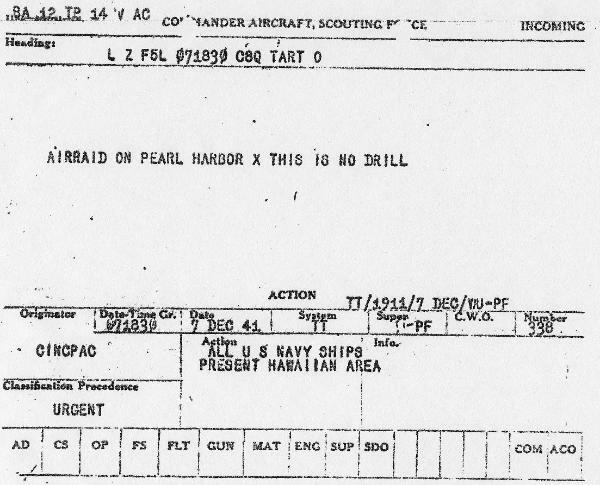 This year, we based the exhibit title on the original radio alert sent out as the attack was unfolding. We have also included new material on the controversies and investigations into the attack (controversies that continue to this day). We All Live in a WHITE Submarine? 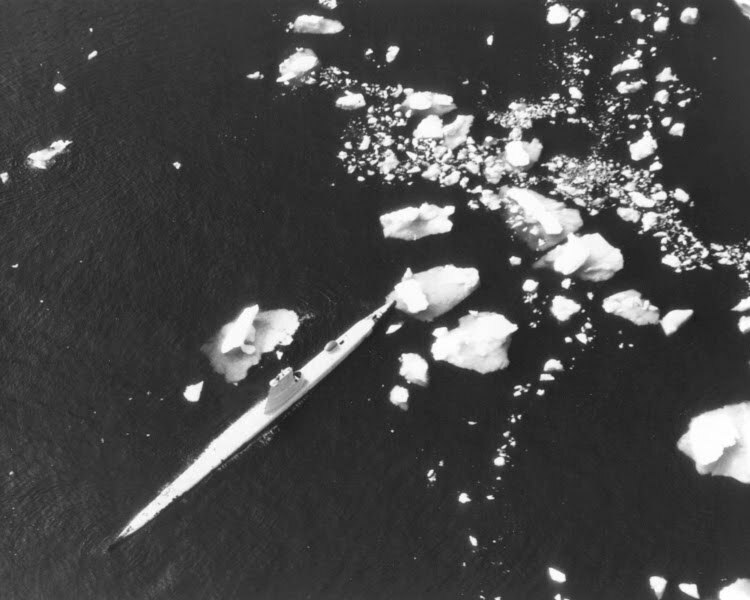 USS Halfbeak (SS-352) conducted tests in the Arctic in 1958. She was painted white to test the concept of camouflaging the submarine amongst the ice. U.S. Navy Official Photograph dated 19 August, 1958, courtesy of the Arctic Submarine Laboratory Program. KTHV, the local CBS affiliate and KARK, the local NBC affliate both featured stories on the Razorback crewmember's reunion. The KTHV story is here. The KARK story is here. AIMM would like to thank all the former crewmembers who took time out out of their personal lives to come and spend time with us, and we would especially like to thank everyone for the warm reception they gave to all the media. We would also like to thank KTHV and KARK for coming down and reporting on the reunion. We're already looking forward to the next work party. Although not featured on their website, the North Little Rock Times, part of the Stephens Media Group that runs several newspapers in Central Arkansas, featured the Razorback Crewmember's reunion on the front page of this week's issue. A photograph of cook Charlie Brown was "above the fold" on the front page, and the story occupied most of the last page of the "A" section. AIMM would like to again thank all the crewmembers who attended the reunion. 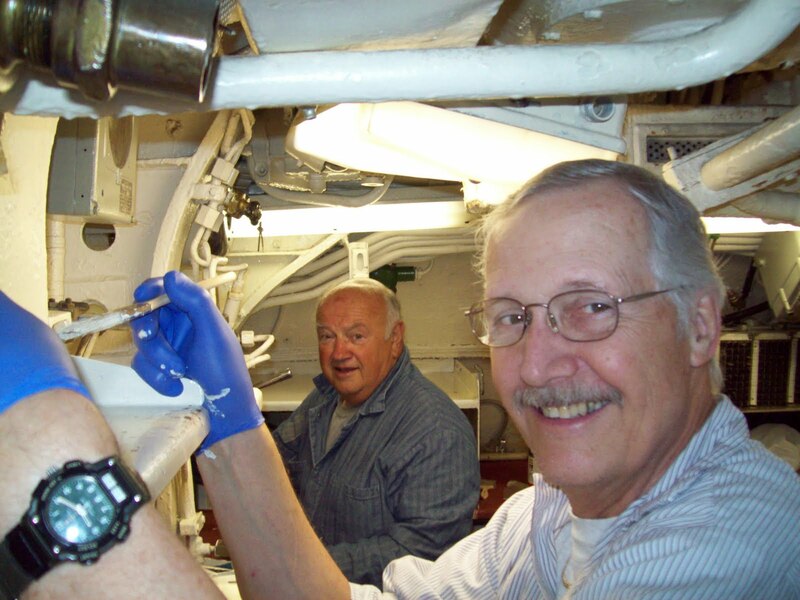 Nearly fifty former USS Razorback crewmembers have returned to their former home to work (and play). The USS Razorback Association had their reunion here in North Little Rock at the Wyndham hotel, just a few blocks from the museum. Ken Brown, one of Razorback's former Captains is flying in from Hawaii to be here. Three former World War II crewmembers are among the many who are here. In addition to the reunion, some of the crew will be staying to work aboard Razorback, as they have done on a regular basis. (The last work party was earlier this year). Among the special jobs the Association hopes to accomplish is raising the #1 periscope. Photograph from the April 2009 work party. 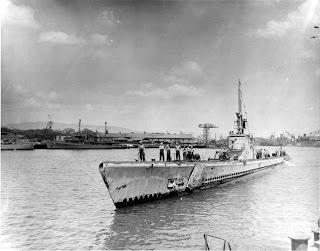 Shortly after the United States entered World War II, submarine commanders began reporting problems with the MK XIV torpedo, the standard torpedo carried by American submarines. (Razorback has three MK XIV torpedoes on display.) Some torpedoes exploded seconds after firing; others ran erratic, or even dangerously circular courses; still others ran too deep and passed harmlessly under their targets. Then, even when a torpedo actually struck its target, the warhead would fail to explode. Nevertheless, a dud torpedo could still sink a ship. Two more torpedoes were fired, but the Japanese ship turned, causing the "fish" to miss. Less than 10 minutes later, LCDR Galantin was surprised to see the freighter slowing down and sinking. Next, sonar reported the ship breaking up, the ship was seen to have capsized and LCDR Galantin watched it sink. Ironically, Halibut would fire two more dud torpedoes that same day, hitting the Japanese cruiser Nachi and sending her to port for repairs. When Nachi reached port, one of the dud torpedoes was still embedded in her side. Thanks to CDR John Alden, USN (ret) for his great article "Downed by a Dud" in the July 2010 issue of The Submarine Review. 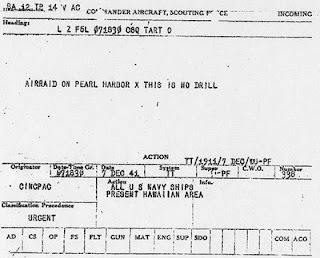 We have just added the MP3 audio file and the transcript of an Oral History interview that was conducted with Captain Joseph Bonds, USN (ret). He was an officer aboard Razorback for the 4th and 5th war patrols, and he stayed aboad for five more years after the war. He started out as an Ensign and left Razorback as a Lieutenant (jg) and Acting Executive Officer. Captain Bonds was able to give us some insights into what life was like aboard Razorback during and after the war. We are working on getting more Oral History interviews up.